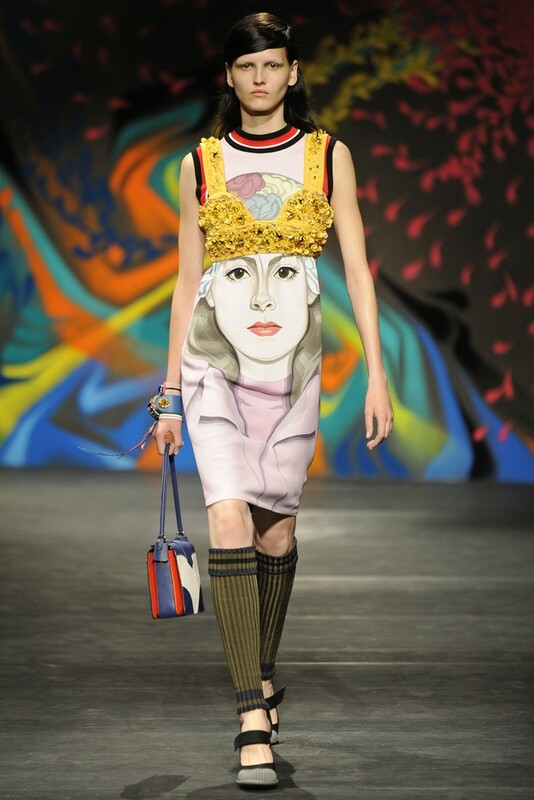 Mexican muralists such as Diego Rivera influenced the huge portraits of powerful women, commissioned from 6 contemporary artists (Jeanne Detallante, El Mac, Mesa, Pierre Mornet, Gabriel Specter and Stinkfish), that decorated the set of the Prada Spring/Summer 2014 Show, and which were reproduced on various pieces (the 7th look, pictured above, revisited Jeanne Detallante’s « Beauty Masks » mural). Other Diego Rivera-inspired collections : Alexis Mabille Couture Spring/Summer 2009 (the Odile Gilbert-styled braids of this show were based on a Diego Rivera’s painting), Steven Alan Autumn/Winter 2012-2013 Menswear (the « Diego Rivera : Murals for The Museum of Modern Art » exhibition, at New York’s MoMA, from November 13, 2011 until May 14, 2012, was the starting point of this collection, which featured handknitted pieces, based on Mexican blankets, that referenced Diego Rivera). Josephine Baker influenced the Prada Spring/Summer 2011 Show. Other Josephine Baker-inspired collections : Juan Carlos Obando Spring/Summer 2012 (Josephine Baker was the muse of this collection), Kevan Hall Autumn/Winter 2007-2008 (Josephine Baker was one of the style icons who were referenced in this show), Lilith Spring/Summer 2011 (this collection paid tribute to Josephine Baker), Louis Vuitton by Marc Jacobs Spring/Summer 2009 (some looks echoed Josephine Baker). Marilyn Monroe in Billy Wilder’s « The Seven Year Itch » was one of the references of the Prada Spring/Summer 2012 Show. Another « The Seven Year Itch »-inspired collection : Dior by John Galliano Couture Autumn/Winter 2002-2003 (this show featured a replica of Marilyn Monroe’s iconic white halter-neck dress, designed by William Travilla, that she wore in « The Seven Year Itch »’s scene when she stood on the ventilation grate). Moreover, in the April 2013 issue of French « L’Officiel », Roger Vivier’s Bruno Frisoni confided that « The Seven Year Itch »’s scene when Marilyn Monroe stands on the ventilation grate is one of his favorite movie scene featuring a woman who plays with her shoes. Vietnam is one of the tropical paradises, transformed into a war zone, which were evoked in the Prada Spring/Summer 2014 Menswear Show, which also highlighted pieces that will be available as part of Prada’s Resort 2014 collection for women. Other Vietnam-inspired collections : Emilio Pucci by Peter Dundas Spring/Summer 2013 (some Asian patterns and military inspirations echoed Vietnam), Josie Natori Spring/Summer 2012 (this collection was partly influenced by the aesthetics of Vietnam), Mary Katrantzou for Longchamp (one of the prints of this capsule collection, launched in January 2012, referenced the architecture of Vietnamese temples), Rachel Roy Spring/Summer 2012 (this collection was based on ’20s and ’30s colonial Vietnam). James Jean’s fairy murals inspired the prints of the Prada Spring/Summer 2008 Show. Some James Jean’s collaborations : Gap (James Jean designed a T-shirt for the Gap (Product) Red Autumn/Winter 2009-2010 line), James Jean X Lane Crawford (on October 18, 2012, to celebrate the launch of James Jean’s handcrafted fine-jewelry collection, OVM, which features the « Bone », « Butterfly », « Drip » and « Strata » lines, Hong Kong’s Lane Crawford unveiled the « Velum » collaboration, featuring James Jean’s line of chiffon printed scarves, pouches and iPhone veils, created around the concept of transparency, and presented at Lane Crawford’s Blitz concept space, within a James Jean-designed installation), Phillip Lim (in 2010, James Jean was commissioned to paint portraits of Los Angeles-based actors, musicians and trendsetters), Prada (in the Summer of 2007, James Jean was commissioned to create a wallpaper for Prada’s New York Epicenter, which spotlighted the heroine, Mary, searching for her lost lamb in a landscape full of carnivorous flowers ; the fairy Mary was also present in the painting James Jean made for Prada’s Spring/Summer 2008 runway, which also inspired the prints of this collection, and the James Lima-directed « Trembled Blossoms » short film, based on James Jean’s illustrations, in collaboration with Michael Rock and Sung Kim, also known as the 2×4). 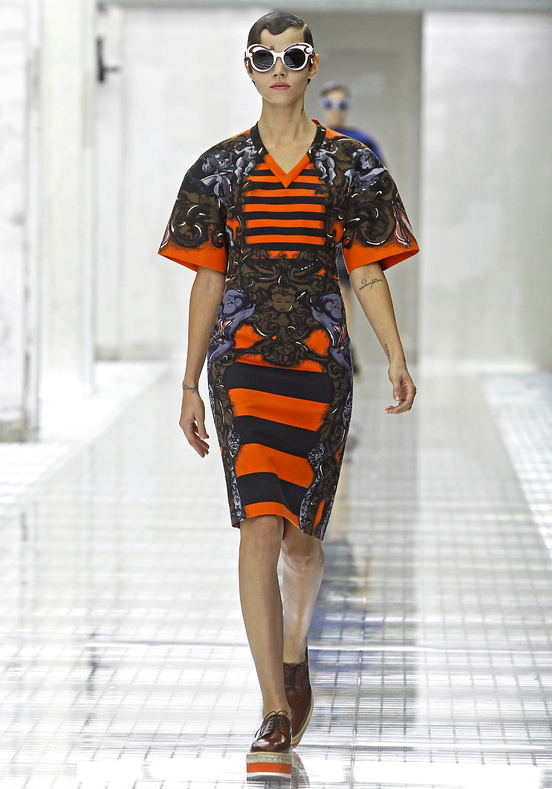 Japan influenced the Prada Spring/Summer 2013 Show, via flowers, leather judo socks and folded pieces. Some Japan-inspired collections : Armani Privé Autumn/Winter 2011-2012, Christopher Kane Spring/Summer 2011 (motifs inspired by Japanese gangs’ tattoos), Dior Couture Spring/Summer 2007 (based on Giacomo Puccini’s « Madama Butterfly »), Erdem for Harrods Autumn/Winter 2010-2011 (influenced by Japanese gardens), Erin Fetherston Spring/Summer 2010 (« Ladyland » collection, based on a trip to Nara), Gareth Pugh Spring/Summer 2011 (samurai influences), Gianfranco Ferré by Tommaso Aquilano and Roberto Rimondi Autumn/Winter 2010-2011 (samurai-style clothes), Givenchy by Riccardo Tisci Couture Spring/Summer 2011 (inspired by Kazuo Ohno and « UFO Robot Grendizer »), Hussein Chalayan Spring/Summer 2011 (« Sakoku » collection, based on Japan’s isolation between 1633 and 1853), Jean Paul Gaultier Spring/Summer 1999 (« Japanese Tourists at the Louvre / Les Touristes japonaises au Louvre » collection), Jean Paul Gaultier Couture Spring/Summer 2004 (« Samurai / Les Samouraïs » collection, inspired by Edward Zwick’s film « The Last Samurai »), Julien David Autumn/Winter 2012-2013 (Japan’s culture is a strong inspiration for Julien David’s collections of clothes and silk scarves), Louis Vuitton by Marc Jacobs Spring/Summer 2011 (inspired in part by the Japanese designers who came in Paris in the ’70s), Proenza Schouler Autumn/Winter 2012-2013 (for this collection, based on the idea of protection, Jack McCollough and Lazaro Hernandez revisited karate and samurai uniforms), Rodarte Autumn/Winter 2008-2009 (inspired by kabuki and Japanese horror films).